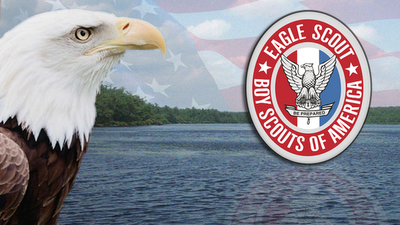 The Trail to Eagle page provides Scouts with resources to help them achieve the Ealge rank and beyond! Be active in your troop, team, crew, or ship for a period of at least six months after you have achieved the rank of Life Scout. Demonstrate that you live by the principles of the Scout Oath and Law in your daily life. List the names of individuals who know you personally and would be willing to provide a recommendation on your behalf, including parents/guardians, religious, educational, and employer references. Earn a total of 21 merit badges (10 more than you already have), including the 12 required merit badges. Boy Scout troop. Patrol leader, assistant senior patrol leader, senior patrol leader, troop guide, Order of the Arrow troop representative, den chief, scribe, librarian, historian, quartermaster, junior assistant Scoutmaster, chaplain aide, or instructor. Varsity Scout team. Captain, cocaptain, program manager, squad leader, team secretary, Order of the Arrow team representative, librarian, quartermaster, chaplain aide, instructor, or den chief. Venturing crew/ship. President, vice president, secretary, treasurer, boatswain, boatswain's mate, yeoman, purser, or storekeeper. While a Life Scout, plan, develop, and give leadership to others in a service project helpful to any religious institution, any school, or your community. (The project should benefit an organization other than Boy Scouting.) The project proposal must be approved by the organization benefiting from the effort, your Scoutmaster and troop committee, and the council or district before you start. 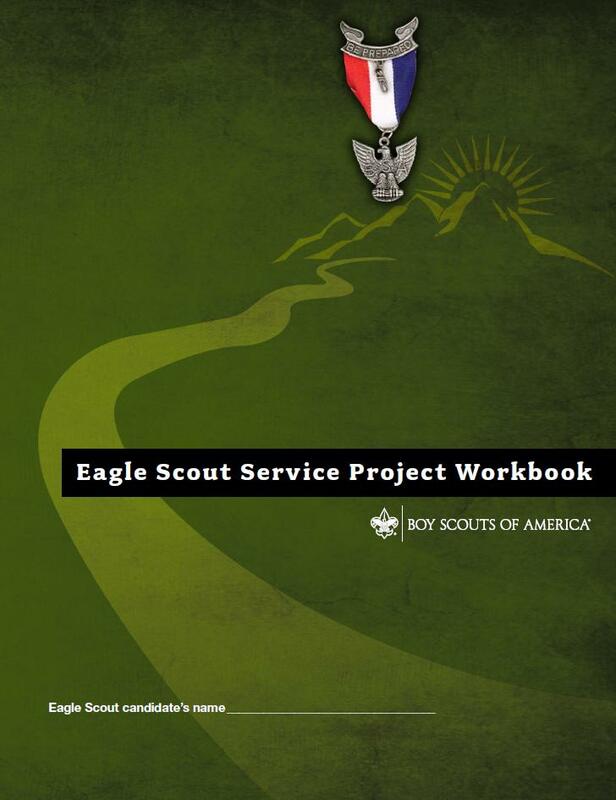 You must use the Eagle Scout Leadership Service Project Workbook, BSA publication No. 512-927 , in meeting this requirement. Successfully complete an Eagle Scout board of review. Merit badges, badges of rank, and Eagle Palms may be earned by a registered Boy Scout, Varsity Scout, or Venturer. He may earn these awards until his 18th birthday. Any Venturer who achieved the First Class rank as a Boy Scout in a troop or Varsity Scout in a team may continue working for the Star, Life, and Eagle Scout ranks and Eagle Palms while registered as a Venturer up to his 18th birthday. Scouts and Venturers who have completed all requirements prior to their 18th birthday may be reviewed within three months after that date with no explanation. Boards of review conducted between three and six months after the candidate's 18th birthday must be preapproved by the local council. A statement by an adult explaining the reason for the delay must be attached to the Eagle Scout Rank Application when it is submitted to the Eagle Scout Service. The Eagle Scout Service at the national office must be contacted for procedures to follow if a board of review is to be conducted more than six months after a candidate's 18th birthday. If you have a permanent physical or mental disability, you may become an Eagle Scout by qualifying for as many required merit badges as you can and qualifying for alternative merit badges for the rest. If you seek to become an Eagle Scout under this procedure, you must submit a special application to your local council service center. Your application must be approved by your council advancement committee before you can work on alternative merit badges. A Scout or Venturer with a disability may work toward rank advancement after he is 18 years of age if he meets the guidelines outlined in the current Guide to Advancement. The National Eagle Scout Association (NESA) provides a number of online resources to assist Scouts in earning the Eagle rank — including an electronic version of the Eagle Scout Rank Application and the Eagle Scout Leadership Service Project Workbook — via their Web site at www.nesa.org .